Explore and treat yourself with the Biblical Health & Beauty Perfumes as were used by the Biblical characters. Enjoy the Authentic Biblical essence of the Myrrh, Jasmine, Frankincense, Spikenard, Lily of the Valleys and Sandalwood, and have the same delicate scent like the Heroes of the Bible Times of the Old and New Testament, Jewish and Christian. 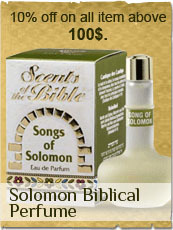 All Biblical Perfumes are made in Israel with the Authentic Bible Land's Plants of Jerusalem and Israel. Many more Holy Land Biblical perfumes available here.